The one bank of Dublin (it’s really not a big town) supplied the festival’s Leprechaun mascot. Since Leprechauns are said to be in the know about gold, I think it was a fitting symbol for a bank. 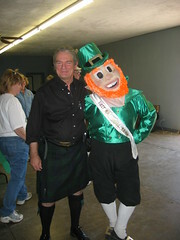 As writers are always in need of money, I thought I’d have my photo taken with the Leprechaun for luck. Book Signing News: Wednesday, I’ll be flying to California for a week of book signings, computer training, research, and writing. I hope to also meet with and develop some SCV contacts, schools, and libraries in that area. I’m still not sure of my final agenda, but I’ll make posts as often as I can. I haven’t been to California since I was sixteen. I hear it’s changed some. For at least two nights, I’ll be in Zane Grey’s home. As I’m working on a Western of my own, I’m sure that stay will be inspirational and informative. IF YOU ENJOYED ST PATRICKS DAY YOU NEED TO ATTEND THE DR. PEPPER FESTIVAL IN MAY AFTER ALL IT IS THE OLDEST DR PEPPER FACTORY IN THE WORLD. I VERY MUCH ENJOYED THIS ARTICLE BUT I HAVE MANY FAMILY MEMBERS WHO RESIDE THERE.